​Things have gone off the rails in San Francisco. 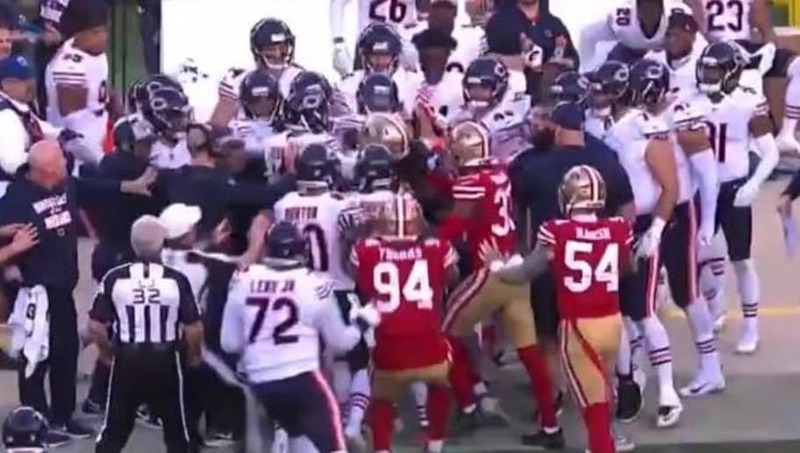 With the Bears leading the 49ers 14-9, San Fran safety Marcel Harris delivered a late hit on a sliding Mitch Trubisky, and a full out brawl ensued on the sideline between both teams. Even Kyle Long, the injured Bears offensive lineman, got involved in the fracas. ​​The fight led to multiple ejections. From the Bears side, wide receiver Josh Bellamy and running back Anthony Miller (who scored a touchdown earlier in the day) got tossed, and on San Francisco, the one and only Richard Sherman was sent to an early shower. Lots of ejections in the #49ers and #Bears game. Richard Sherman, Josh Bellamy, and Anthony Miller all get early showers! What a day. This should get the Bears even more amped for the postseason.